Manchester United are reportedly in a transfer battle with Paris Saint-Germain and England wonderkid Jadon Sancho in the prize. 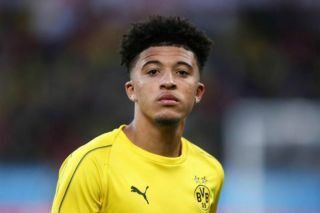 United and PSG will go head-to-head in the Champions League on Wednesday night but the two European heavyweights are also set to fight it out for 18-year-old Sancho in the summer, according to the Sunday Express. It is claimed by the Express (as you can see on their backpage below) that United are prepared to pay a British-record transfer fee to land Sancho, who only cost Dortmund around £10m when they plucked him from Manchester City in the summer of 2017. Sancho has dazzled Bundesliga fans since swapping the City reserves for Dortmund’s first team. He has scored eight goals and provided 10 assists in 24 league appearances this season. Sancho made his senior England debut last year too and currently has three caps. The youngster’s decision to move abroad was largely motivated by his desire to play more, after being somewhat stifled at City. So United would presumably need to offer him assurances that he would have a prominent role at Old Trafford.